BUENOS AIRES (Reuters) - China and the United States agreed to a ceasefire in their bitter trade war on Saturday after high-stakes talks in Argentina between U.S. President Donald Trump and Chinese President Xi Jinping, including no escalated tariffs on Jan. 1. Trump will leave tariffs on $200 billion worth of Chinese imports at 10 percent at the beginning of the new year, agreeing to not raise them to 25 percent "at this time", the White House said in a statement. "China will agree to purchase a not yet agreed upon, but very substantial, amount of agricultural, energy, industrial, and other product from the United States to reduce the trade imbalance between our two countries," it said. Both countries agreed they will try to have this "transaction" completed within the next 90 days, but if this does not happen then the 10 percent tariffs will be raised to 25 percent, it added. The Chinese government's top diplomat, State Councillor Wang Yi, said the negotiations were conducted in a "friendly and candid atmosphere". "The two presidents agreed that the two sides can and must get bilateral relations right," Wang told reporters, adding they agreed to further exchanges at appropriate times. "Discussion on economic and trade issues was very positive and constructive. The two heads of state reached consensus to halt the mutual increase of new tariffs," Wang said. "The two sides agreed to mutually open their markets, and as China advances a new round of reforms, the United States' legitimate concerns can be progressively resolved." The two sides would "step up negotiations" toward full elimination of all additional tariffs, Wang said. China's goal was to persuade Trump to abandon plans to raise tariffs on $200 billion of Chinese goods to 25 percent in January, from 10 percent at present. Trump had threatened to do that, and possibly add tariffs on $267 billion of imports, if there was no progress in the talks. Trump told Xi at the start of their meeting he hoped they would achieve "something great" on trade for both countries. 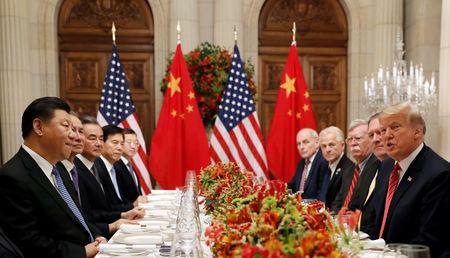 He struck a positive note as he sat across from Xi, despite the U.S. president's earlier threats to impose new tariffs on Chinese imports as early as the next year. He suggested that the "incredible relationship" he and Xi had established would be "the very primary reason" they could make progress on trade. The White House said Xi, "in a wonderful humanitarian gesture", had agreed to designate fentanyl a controlled substance. "This was an amazing and productive meeting with unlimited possibilities for both the United States and China. It is my great honor to be working with President Xi," Trump said in the statement. Earlier on Saturday, the leaders of the world's top economies called for WTO reform in their final summit statement. Trump has long railed against China's trade surplus with the United States, and Washington accuses Beijing of not playing fairly on trade. China calls the United States protectionist and has resisted what it views as attempts to intimidate it. The two countries are also at odds over China's extensive claims in the South China Sea and U.S. warship movements through the highly sensitive Taiwan Strait. The United States is unhappy with what it says is the WTO's failure to hold China to account for not opening up its economy as envisioned when China joined the body in 2001. The European Union is also pushing for sweeping changes to how the WTO operates. U.S. officials have warned about China's increasing influence across swaths of the developing world, including Latin America. G20 summit host Argentina is expected to sign a series of deals with China on Sunday during a one-day state visit by Xi. Apart from trade and climate change, Russia's seizure of Ukrainian vessels drew condemnation from other G20 members, while the presence of Crown Prince Mohammed bin Salman at the summit raised an awkward dilemma for leaders. Saudi Arabia's de facto ruler arrived amid controversy over the killing of Saudi journalist Jamal Khashoggi, though Saudi officials have said the prince had no prior knowledge of the murder.